Mainstream dogmas cannot keep up with the sheer amount of discoveries that have been made in the last couple fo years directly challenging well-established scientific beliefs of evolution. While many discoveries have been kept away from society, the sheer amount of new discoveries being made in recent years has researchers scratching their heads, and it seems that after all, history, as we have been taught, is WRONG. Known as the Patralona Skull, it is a discovery that has the scientific community perplexed. The story about the skull and where it was found goes back to 1959 when a narrow cave was found by a boy. After a couple of villagers be noted inside the cave, they discovered it was rich in numerous minerals. Further exploration of the cave revealed a mysterious human skull embedded into the rock wall of the cave. Later excavations revealed a number of fossils and tools. The mysterious skull was removed from the Petralona cave and sent to the University Thessaloniki in Greece for further research. The archaeological community agreed that when research concluded, the skull would be sent to the local museum so everyone could appreciate this incalculable historical artifact. However, the skull never made it to the museum as analysis revealed SHOCKING results. According to researchers, the skull had been trapped inside the cave for a period of 700,000 years, making it the oldest skull ever discovered on the European continent. According to Dr. Paulianos, the leading researcher who analyzed the skull, the ‘Patralona Man’ evolved independently in Europe and is not a descendant of any known species to come out of Africa. This means that the skull is the ultimate proof that a different, ‘suppressed’ evolutionary path exists which directly opposes the ‘Out-of-Africa’ theory, a doctrine firmly accepted by mainstream scholars today. The hugely controversial skull was analyzed in 1964 by German researchers who tried very hard to debunk the discovery claiming that the skull was in fact 50,000 years old and that it belonged to a species that did com out of Africa. However, further analysis in 1971 by United States researchers proved once again that the Petralona skull was 700,000 years old. The date was established with the use of the caves sediments and stratigraphy. Around 15 researchers from around the globe have studied the skull, and all of them obtained similar results that support the finding of Dr. Paulino. Researchers on the skull continued until 1983 when a dictatorship governed Greece, which suppressed further studies, depriving public access to the cave, the artifacts, and the controversial skull. Foreign researchers were deprived of access and could not research it further. 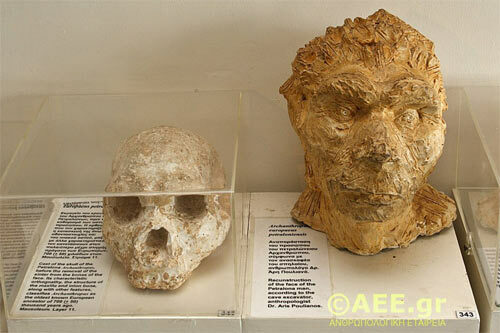 Anthropological Society of Greece went top court and obtained access to the cave and the skull. Mor recent research has shown that the skull belonged to the Homo Erectus but has isolated characteristics of Neanderthals and strong European traits. However, researchers believe that the Skull belonged either to Homo Sapiens or part Homo sapiens, contradicting the out of Africa theory. Dr. Paulianos firmly states that the Petralona skull is derived from an independent species of hominids which are not related to the Homo Erectus. The research done by Dr. Paulianos is firmly rejected by a number of researchers and their academic circles. In 2012, Dr. Paulianos and his wife were assaulted. The controversial results of his research brought on numerous problems. Dr. Paulianos was deprived of access to the cave and was halted before he could conclude his research. The story has since then been a major coverup. However, more discoveries were made in the cave. The Anthropological Association of Greece announced the discovery of two 800,000-year-old pre-human skeletons, a number of different species, and evidence of the oldest use of fire on the planet. In addition to all of this, researchers also discovered the remains of a girl which is believed to be 11 million years old. Most of the above is considered as pseudoscience by ‘serious’ researchers who conclude that the date-range proposed by Dr. Paulianos and other researchers is impossible and ignored scientific methodology. The Journal Nature and Science have refused to publish the Anthropological Association’s submissions. Many researchers firmly believe that the reason why this discovery has been criticized and ignored by mainstream scholars is because it radically changes the history of our species. These discoveries are just a small part of many other findings which clearly indicate history is wrong and needs to be fully revised and rewritten. The debate regarding the age of the skull continues today, and mainstream researchers firmly reject the idea that the skull belongs to an independent species and that it is around 700,000 years old.